Sarah Nader- snader@shawmedia.com Prairie Ridge's Sarah Kilhoffer (left) and Sarah Le Beau celebrates after winning the Class 4A Cary-Grove Regional final against Cary-Grove Friday, February 21, 2014. Prairie Ridge won, 46-42. Sarah Nader- snader@shawmedia.com Prairie Ridge's Sarah Le Beau celebrates after Prairie Ridge won the Class 4A Cary-Grove Regional final against Cary-Grove Friday, February 21, 2014. 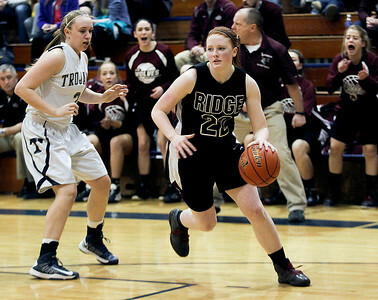 Prairie Ridge won, 46-42. 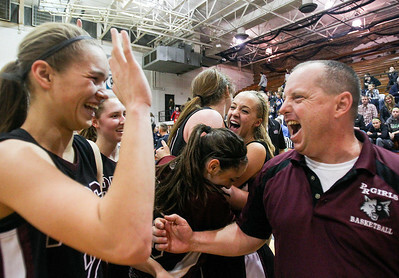 Sarah Nader- snader@shawmedia.com Coach Rob Baker celebrates with the girls basketball team after they won the Class 4A Cary-Grove Regional final against Cary-Grove Friday, February 21, 2014. 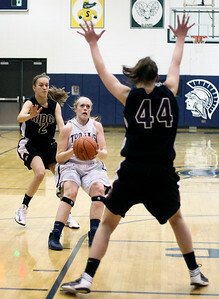 Prairie Ridge won, 46-42. 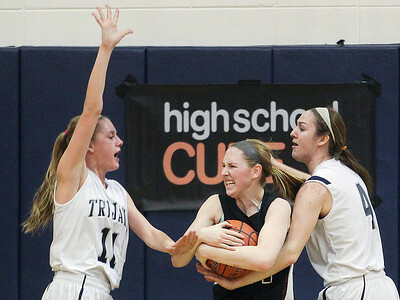 Sarah Nader- snader@shawmedia.com Cary-Grove's Candace Cunningham (left) guards Prairie Ridge's Kelly Kiendworth with Cary-Grove's Abby Glaysher during the fourth quarter of Friday's Class 4A Cary-Grove Regional final Friday, February 21, 2014. Prairie Ridge won, 46-42. Sarah Nader- snader@shawmedia.com Prairie Ridge's Kirsten Voel-Pel (center) loses control of the ball during the fourth quarter of Friday's Class 4A Cary-Grove Regional final against Cary-Grove Friday, February 21, 2014. Prairie Ridge won, 46-42. Sarah Nader- snader@shawmedia.com Prairie Ridge's Maddie Drain (back) guards Cary-Grove's Brianne Prank while she shoots during the third quarter of the Class 4A Cary-Grove Regional final against Cary-Grove Friday, February 21, 2014. 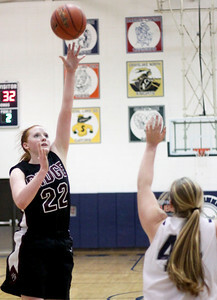 Prairie Ridge won, 46-42. Sarah Nader- snader@shawmedia.com Cary-Grove's Brianne Prank (left) guards Prairie Ridge's Maddie Drain as she shoots during the second quarter of the Class 4A Cary-Grove Regional final Friday, February 21, 2014. 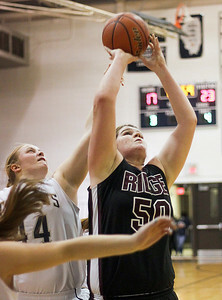 Prairie Ridge won, 46-42. Sarah Nader- snader@shawmedia.com Cary-Grove's Sarah Kendeigh (left) guards Prairie Ridge's Kelly Kiendworth as she dribbles towards the basket during the fourth quarter of the Class 4A Cary-Grove Regional final Friday, February 21, 2014. Prairie Ridge won, 46-42. Sarah Nader- snader@shawmedia.com Prairie Ridge's Aly Clark shoots during the third quarter of the Class 4A Cary-Grove Regional final against Cary-Grove Friday, February 21, 2014. Prairie Ridge won, 46-42. 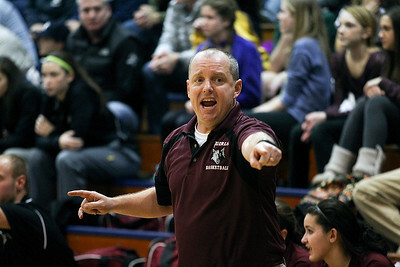 Sarah Nader- snader@shawmedia.com Prairie Ridge's girls basketball head coach Rob Baker watches Friday's Class 4A Cary-Grove Regional final against Cary-Grove Friday, February 21, 2014. Prairie Ridge won, 46-42. 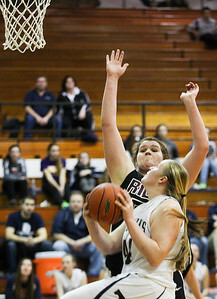 Sarah Nader- snader@shawmedia.com Cary-Grove's Katie Barker (left) guards Prairie Ridge's Aly Clark while she brings the ball towards the basket during the fourth quarter of the Class 4A Cary-Grove Regional final Friday, February 21, 2014. Prairie Ridge won, 46-42. Sarah Nader- snader@shawmedia.com Cary-Grove's Cary-Grove's Sarah Kendeigh (center) gets ready to shoot over Prairie Ridge's Kirsten Voel-Pel during the first quarter of the Class 4A Cary-Grove Regional final Friday, February 21, 2014. Prairie Ridge won, 46-42. 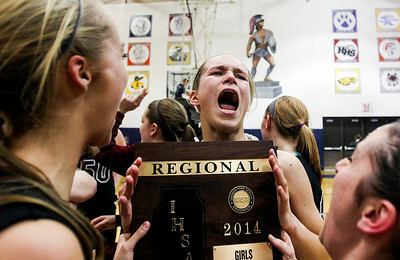 Prairie Ridge's Sarah Le Beau celebrates after Prairie Ridge won the Class 4A Cary-Grove Regional final against Cary-Grove Friday, February 21, 2014. 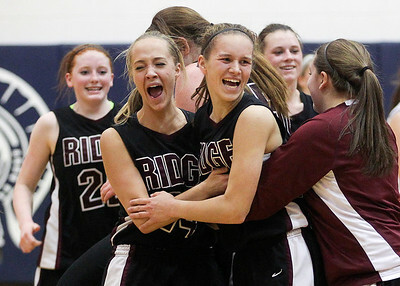 Prairie Ridge won, 46-42.